When our hearts are smiling, our faces will too. Recently my kids and I were looking at some photos from a couple years ago. Photos we took on happy occasions, holidays, Mother’s Day, and a family vacation … all with me in them and the people I loved most. She already knew this all too well, as did my other two children, since we’d all been walking this hard road together. But I found it so interesting she noticed that even though I did my best to wear a smile, feel happy and look happy, the sadness in my eyes told the real story. My spirit was crushed, and even the smile on my face couldn’t disguise it. When someone has deep sorrow and a lack of joy in their heart, you can read it in their expression. When they have true joy in their heart, you can see that in their countenance, too. Joy is an inner condition reflected in our outer expression. A condition that’s only possible through the peace, love and healing of Jesus Christ, especially when our spirits are crushed. This is the truth Solomon was sharing in today’s key verse, Proverbs 15:13. “A happy heart makes the face cheerful, but heartache crushes the spirit.” Everyone faces trials in life, but our faith and our attitude about those problems is what will affect our joy, drive how we feel and ultimately, determine who we become and even what we look like. Our internal level of joy is evident in our external demeanor. When we let life or other people dictate our joy, our heart condition deteriorates, and our smiles are at stake, too. This Scripture affirms that if we allow our thoughts and emotions to stay negative, or if we allow other people or difficult circumstances to control our happiness, we will feel crushed and broken, which will be reflected in our expression. Yet if we seek joy from Christ in the midst of adversities, we can and will feel true joy, and our faces will reflect that joy. Not long after those photos were taken, I remember making a bold commitment to myself and to God to find happiness again, no matter what. I began to intentionally change my thought patterns and try to think positively instead of negatively. I earnestly asked God every single day to restore my joy — the joy of my salvation — even if He didn’t restore my situation. And you know what? Over time and through a lot of faith and prayers, He did exactly that! Although my situation remained the same, my heart and mind did not. My happiness has returned, and my authentic happy-faced smile has, too. Getting our smile back starts on the inside. When our hearts are smiling, our faces will too. Dear Jesus, I surrender to You the people and circumstances where I’ve tied my joy. Restore the joy of my salvation and help me find my beautiful, genuine smile again. I want to love the life You’ve given me and enjoy life to the fullest, despite what it might look like. I commit today to do exactly that. In Jesus’ Name, Amen. Ever felt like everyone else’s life seemed packed with blessings, while yours was buried in burdens? You're not the only one. In her new book, Love Life Again, Tracie Miles helps you identify the stumbling blocks to your joy and offers tools and insights to take back control of your happiness. The Online Bible Study begins TODAY, September 4. Register now, and we’ll send you the first three chapters of Love Life Again for free! Join Tracie’s encouraging Love Life Again Facebook community for ongoing smile support, and participate in her upcoming Facebook Live event! When is the last time you felt truly joyful and happy with the life you have? What steps can you take to begin reclaiming your joy? Let us know your thoughts! Ask yourself: What can I do today to bring a smile to my face? How might I feel if I intentionally chose to smile more all throughout the day, no matter what was going on around me? 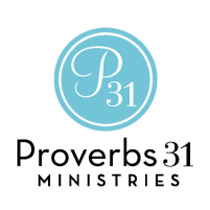 Proverbs 31 Ministries thanks David C. Cook for their support of P31 Online Bible Studies and Encouragement for Today devotions. What’s a Good Father Really Like?